Wat is er mooier dan goed voorbereid op reis te gaan. Landkaarten zijn een ideale manier om meer te weten te komen over je reisbestemming Indonesië. Vind hieronder het aanbod landkaarten van Indonesië, onmisbaar in de auto en een perfekte aanvulling op de reisgids. Naast praktische landkaarten zijn er ook stadsplattegronden, ideaal om een stad te ontdekken. Sommige kaarten zijn ook waterproof. Maak een keus uit o.a. Freytag & Berndt, Nelles of Rough Guides. Bereid je route alvast voor en bestel makkelijk online een wegenkaart van Indonesië. Hele goede kaart van vooral het zuiden van Bali. Veel details voor de toeristische plaatsen met stadskaarten en bijv. Hotelaanduidingen. The Bali Travel Map from Periplus is designed as a convenient, easy-to-use tool for travelers. Created using durable coated paper, this map is made to open and fold multiple times, whether it's the entire map that you want to view or one panel at a time. Following highways and byways, this map will show you how to maneuver your way to banks, gardens, hotels, golf courses, museums, monuments, restaurants, churches and temples, movie theaters, shopping centers and more! This 9th edition area maps and city plans are scaled to: Bali at 1:250,000 South Bali at 1:100,000 Amed at 1:60,000 Tulamben at 1:60,000 Nusa Dua Area at 1:20,000 Nusa Lembongan at 1:60,000 Lovina Beach at 1:25,000 Ubud at 1:25,000 Amlapura at 1:20,000 Padangbai at 1:30,000 Candidasa at 1:20,000 Canggu & Kerobokan at 1:25,000 Kata Area at 1:25,000 Semarapura at 1:25000 Singaraja at 1:25,000 Sanur at 1:20,000 Denpasar at 1:25,000 A unique, easy-to-handle folding system that allows you to view the map one panel at a time for quick reference, and a fully digital map base, which allows our maps to be frequently updated. 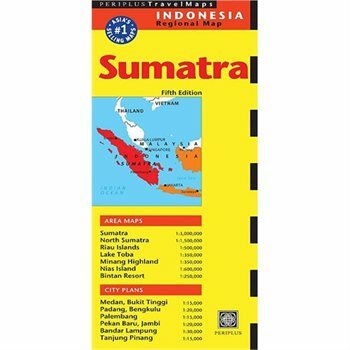 Periplus Travel Maps cover most of the major cities and travel destinations in the Asia-Pacific region. The series includes an amazing variety of fascinating destinations, from the multifaceted subcontinent of India to the bustling city-state of Singapore and the 'western style' metropolis of Sydney to the Asian charms of Bali. All titles are continuously updated, ensuring they keep up with the considerable changes in this fast-developing part of the world. This extensive geographical reach and attention to detail mean that Periplus Travel Maps are the natural first choice for anyone traveling in the region. Tweetalige kaart (Engels en Duits). Door ingetekende lengte- en breedtegraden is het gebruik van GPS mogelijk. Met hoogtelijnen en uitgebreid wegennetwerk: daarnaast worden ook de afstanden tussen belangrijke plaatsen duidelijk leesbaar weergegeven. Het kleurgebruik is zodanig dat je een goede indruk krijgt van hoogteverschillen en soorten landschap. 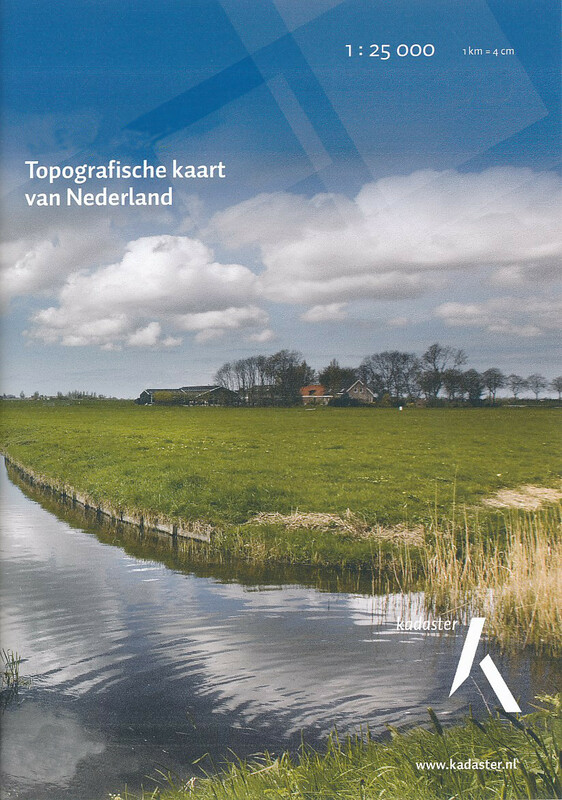 Natuurlijk staan de toeristische bezienswaardigheden duidelijk vermeld. Met een kleine omgevingskaart van Jakarta in meer detail. Gedrukt op water- en scheurvast papier! Polyart is een synthetisch product vrij van giftige stoffen dus duurzaam. Het papier gaat echt lang mee. Topography is indicated by altitude colouring with numerous spot heights and names of mountain ranges and passes. Salt lakes, swamps, seasonal rivers and glacier are also shown. Detailed presentation of the road network includes minor roads and tracks and railways are also shown. Internal administrative units are presented with their boundaries and names. National parks and other protected areas are highlighted. A wide range of symbols mark various places of interest. Map legends include English and all the maps have an index of localities. Handige geplastificeerde kaart van Bali met een algemene kaart maar ook veel extra kleine detailkaartjes van bekende gebieden als Ubud, Sanur of Kuta. Met register en wat extra informatie. Folded, waterproof, road map, with multilingual legend. The main map covers Bali at 1:200,000. Inset maps cover Denpasar, Kuta, Nusa Dua, etc. The Berndtson map is a watersafe, durable, laminated and easy to fold road map. The map features overview and detail maps with elaborate road and street network, points of interest, public facilities, hotels, shopping centers and markets, including a time zone map as well as useful statistics, temperature, weight and measurement conversion charts, climate charts with temperatures, sunshine hours, precipitation and humidity. Special feature of the map is a selection of the 15 most popular POIs (points of interest) shown in a LocatorMAP and with short text description including opening hours and useful web-sites. Indonesia is a huge and varied country of many islands and many cultures. The Javanese dominate the country. Not only is the island centrally located, but the rich soil and hard-working people has turned the island into the economic powerhouse driving the countrys economy. 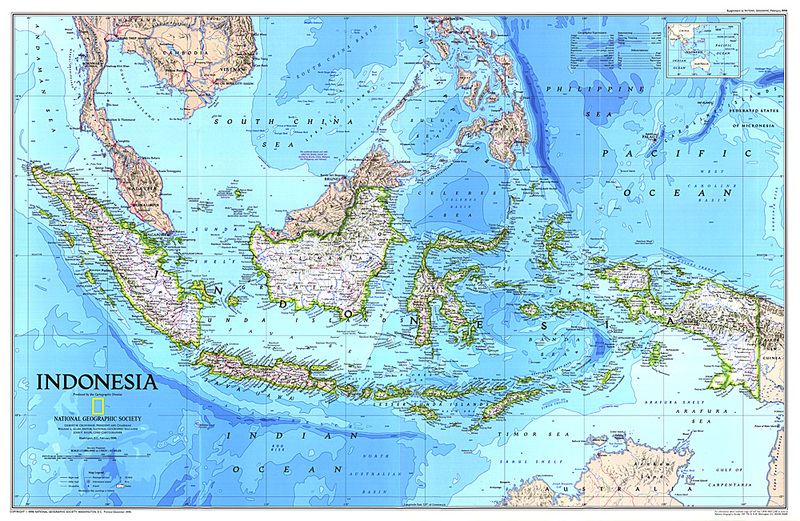 Indonesias capital, Jakarta, is located on the islands north shore, and is the subject of a separate ITM map. This map concentrates on the islands many charms: the temples of Yogyakarta, the colonial architecture of Surabaya, and the rustic charm of mountainous East Java. 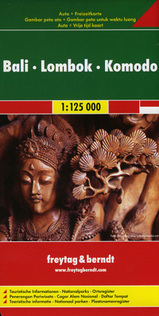 The map abounds in insets, including central Jakarta at 1:25 000, but also Cirebon, Bandung, and Solo, Semarang, Surabaya, Yogyakarta, Malang, and Yoga to Prambanan at 1:90,000, and the Dieng Plateau at 1:35,000. The famous island of Krakatoa is also included. This map is double-sided (east/west). Roads by classification, ferry route, ruins, bird sanctuary, national parks, volcanoes, non-active volcanoes, hotel, surfing, beaches, waterfalls, hindu temples, buddist temples, mosques, bus terminal, museums, shopping centres, tourist information, points of interest and other information. Een degelijke landkaart van Indonesië met aanduidingen van o.a. nationale parken, vliegvelden en grote wegen. Als overzichtskaart goed te gebruiken. De nadruk ligt echter vooral op de natuurkundige aspecten. Scheur- en watervast! Met een kleine kaart van Jakarta. The 7,000 islands that make up this country are very difficult to portray on one piece of paper, but we have been able to show main towns, roads, rail connections, ferry routes, airports, and touristic/historic attractions. Folded road and travel map in color. Scale 1:2,400,000. distinguishes roads ranging from 4 lane National roads to tracks. Legend includes ferry routes, waterfalls, international airports, domestic airports/airfields, sea ports, places of interest, hotels, longhouses/shelters/lodges, hiking centres, museums, forts/fortresses, hot springs, caves, National Parks, nature reserves, wild life/bird reserves, marine reserves, beaches, watersports, diving/surfing sites, fishing sites, swamps, coral reefs. Goede kaart met op de ene zijde Bali, schaal 1:145.000 en op de andere kant Lombok, schaal 1:130.000 Lombok may not be as well-known as Bali, but both Indonesian islands are prime tourist destinations. 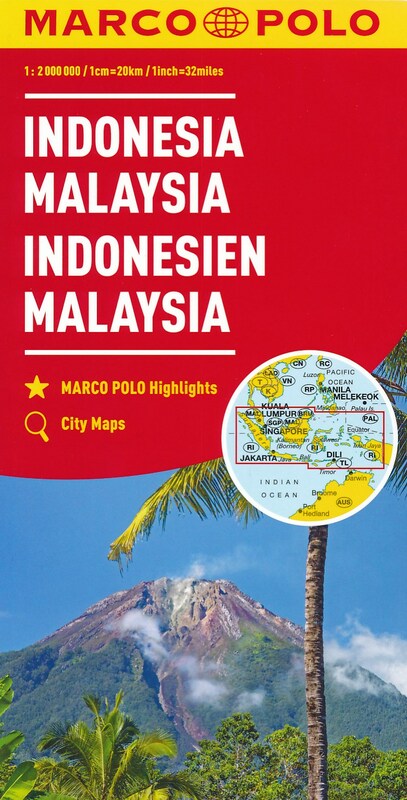 This edition includes new inset maps of Denpasar, the main city in Bali, as well as maps of the Kuta-Legan and Sanur beach resort areas, and of the northern city of Singaraja. The Lombok map on the reverse side includes a map of Mataram, the principal city and a special inset showing the three Gili Islands off the west coast, with their dozens of resort hotels. Legend Includes: Roads by classification, Airports, Turtle Reserve Area, Bird Sanctuary, Hospitals, Hotels, Park Headquarters, World Heritage, Volcano, Habour, Police Stations, Viewpoints, Beaches, Gas Stations, Mines and much more. Goede duidelijke wegenkaart aan twee kanten bedrukt. Alle details staan er op! Met toeristische informatie, Nationale Parken en een index. Detailed, double-sided road map of Bali, Lombok and Komodo islands. Clearly shows the national road network and selected provincial and local roads, with each class of road clearly indicated and road numbers shown. Intermediate driving distances between locations are shown in kilometres alongside the road, motorway filling stations are shown and motorway junctions are indicated. Topography is shown with relief shading and some spot heights, and colour shading is used to indicate land types such as forests or marshland. International and provincial boundaries are clearly marked, as are National Parks, nature reserves and restricted military areas. Symbols indicate various sights & locations of tourist interest, such as churches, leisure & sports destinations, panoramas & viewing points, monuments and historic sites. Some hotels and campsites are marked. Railway lines, airports, ports and marinas are also shown. Duidelijk leesbare kaart (aan twee kanten bedrukt) van Java. Met allerlei symbolen worden de bezienswaardigheden goed weergegeven. Detailkarte: Borobudur 1 : 400 Dieng Plateau 1 : 100.000 Prambanan 1 : 2.900 Trowulan 1 : 62.500 Yogya to Prambanan 1 : 133.300 Stadtplan: Bandung 1 : 35.700 Central Bogor 1 : 26.300 Cirebon 1 : 45.500 Malang 1 : 25.000 Semarang 1 : 43.500 Solo 1 : 26.300 Surabaya 1 : 35.700 Yogyakarta 1 : 30.000 On one side is western Java with a large street plan of central and northern Jakarta, plus plans of central Bandung, Bogor and Cirebon. On the reverse the central and eastern part of the island is shown with street plans of central Yogyakarta, Surabaya, Solo (Surakarta), Semarang and Malang. Enlargements present in more detail the Dieng Plateau and the access from Yogyakarta to Prambanan. Also included are detailed plans of the Prambanan temple complex and Borobudur. Prachtige wandkaart van Indonesie: zeer duidelijk kaartbeeld, waarbij ook de kleinere eilanden goed tot hun recht komen. Heel mooi kleurgebruik voor dieptes in de zeeën rondom de eilanden. Formaat 90 x 60 cm This vibrant map features subtle relief shading of mountainous regions and ocean bathymetry. Covering Indonesia, Malaysia, and Brunei, this map features: Thousands of place names; Roads, railroads, and airports; Mountains, rivers, lakes, and swamps; Oil fields and pipelines.